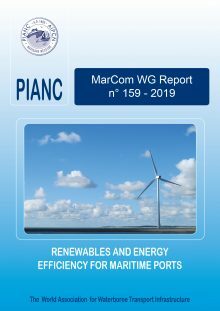 This report analyses the state-of-the-art related to the implementation of renewable energy devices and energy efficiency measures in port infrastructure. WG 159 distributed a questionnaire to port authorities and port operators worldwide to understand how facilities use electricity, the planning tools utilised and the technology used at port terminals. Based on the questionnaire and the expertise of the Working Group members, the report provides guidance for evaluating and implementing Renewable Energy (RE) resources like wind, solar and ocean. The report discusses Energy Efficiency (EE) technologies and cost-effective solutions for port facilities. The objective is to identify RE resources and EE measures through Energy Masterplans that can be implemented by Port Authorities and Terminal Operators leading to energy systems that minimise power consumption and reduce CO2 emissions. The vision is to develop self-sustainable ports using RE and EE technologies. providing general advice for the implementation of both commercial and experimental projects related to the direct connection and/or integration of renewable energy devices to maritime port infrastructure, taking into account port engineering aspects, environmental, operational constraints, electrical aspects, economic and financial aspects and efficiency of the systems. The report provides a general approach to RE and EE opportunities from a strategic perspective and describes the best available technologies at present. The report does not address a detailed analysis of all these technologies because they are advancing quickly. The continuous evolution of RE and EE technologies may require periodic updates to this report. The contents of the report are applicable not only for project planners (greenfield and brownfield projects) but also for port authorities and terminal operators.